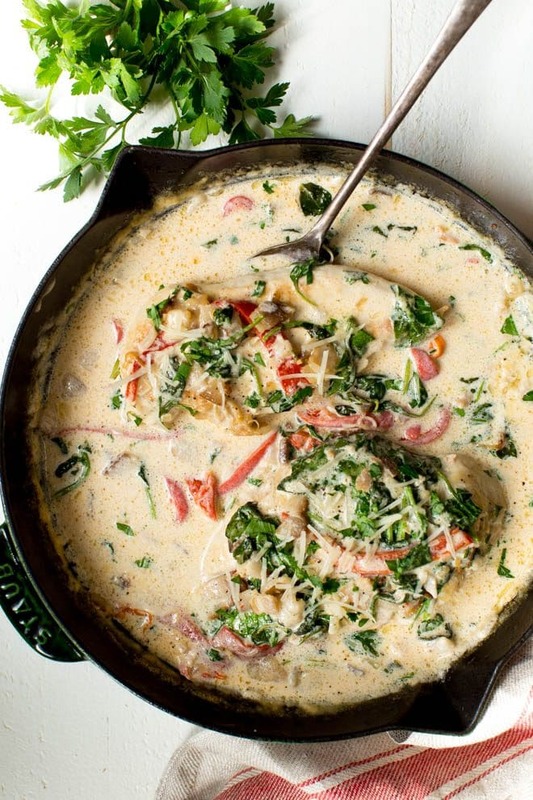 Creamy Chicken Bacon Skillet with Spinach and Roasted Red Peppers is a flavorful one pan meal that is ready in less than 30 minutes! Sometimes the best meals are an accident. The meal that I am sharing with you today is a recipe gone wrong…or right! 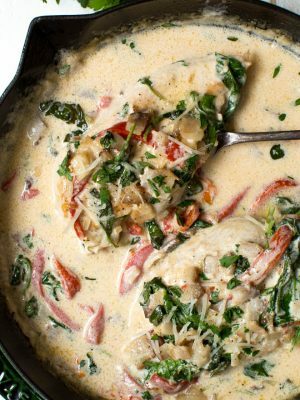 Creamy Chicken Bacon Skillet with Spinach and Roasted Red Peppers is an easy and indulgent one pan meal. A small amount of bacon adds a lot of flavor. 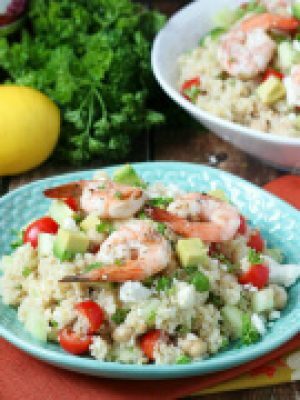 It combines with a few other simple ingredients and a creamy sauce to create a dish that is impressive and perfect for any day of the week. 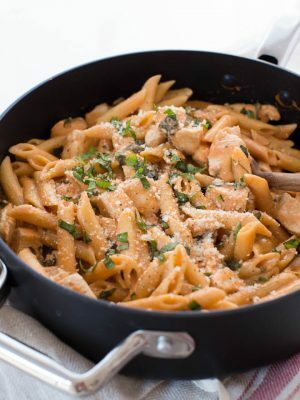 As I was halfway through testing a recipe for a creamy chicken, bacon and mushroom skillet, I realized that I didn’t have any mushrooms in my refrigerator! At that point, I decided to go a different direction with the recipe and use other ingredients in my refrigerator. 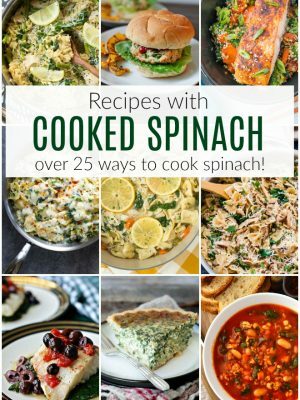 Luckily, I always have spinach and also had a jar of roasted red peppers. 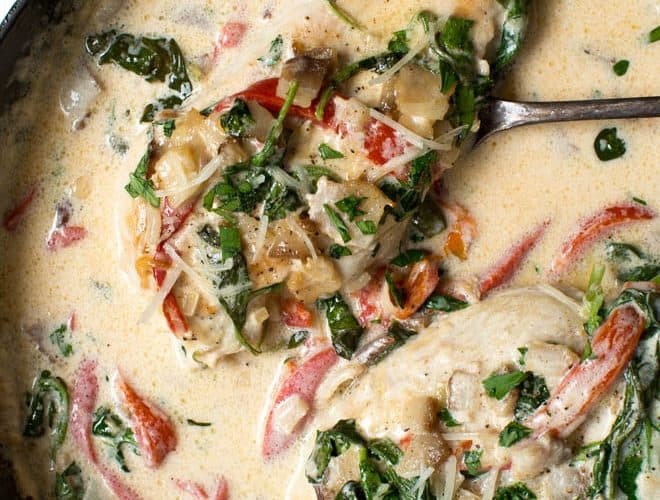 The combination of the chicken, bacon, spinach and roasted red peppers with a creamy sauce creates a meal that is even better than the original creation. The entire recipe cooks in the skillet. I like to use larger sized chicken breasts so I finish baking it in the oven until cooked through. 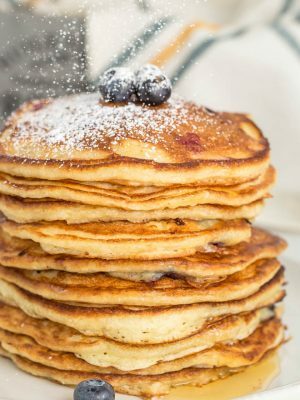 However, if you prefer to cook the entire meal on the stove, you can adapt the cook time while frying in the skillet and cook until heated through. 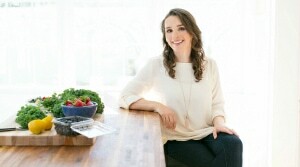 I like to serve this recipe with rice, quinoa or steamed vegetables. 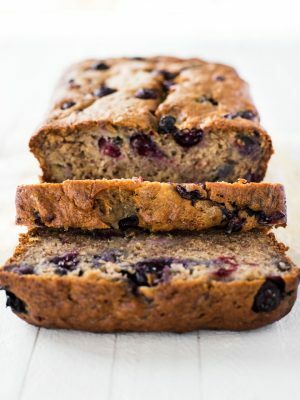 The recipe reheats well and is perfect for any time of the year. 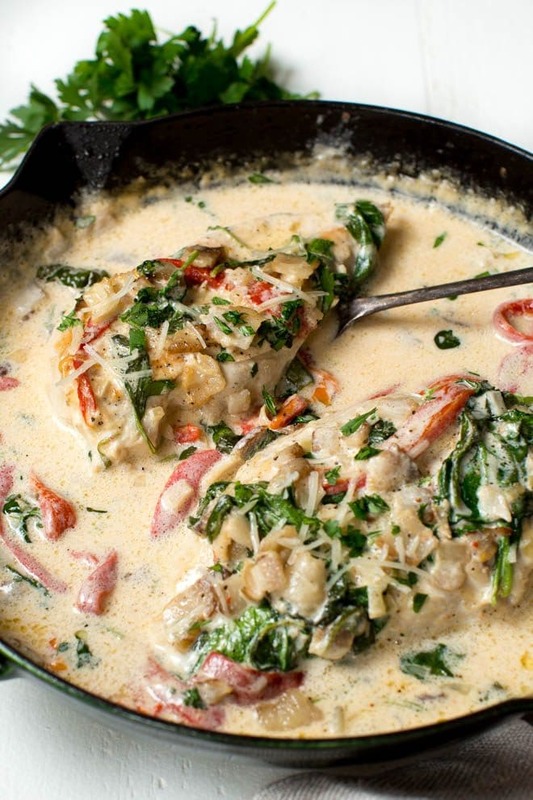 Add this Creamy Chicken Bacon Skillet with Spinach and Roasted Red Peppers to your dinner menu soon and you won’t be disappointed. 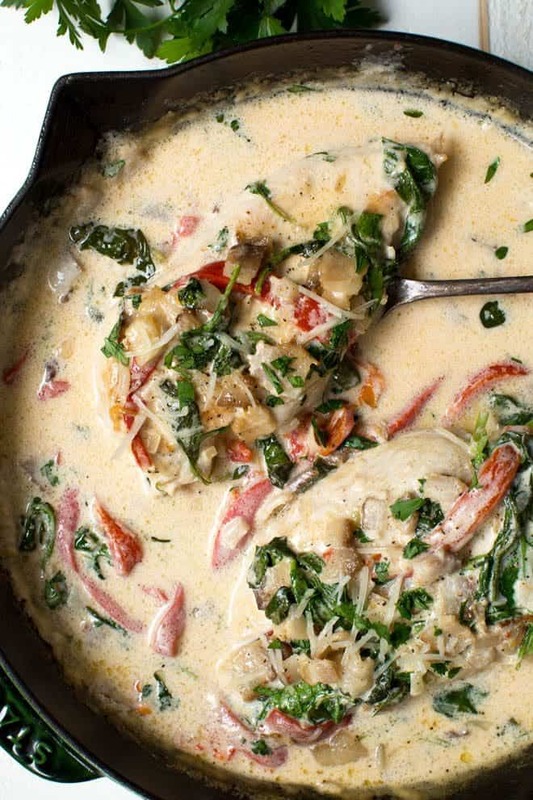 Heat a large, oven proof pan or skillet over medium high heat. Cook the chicken about 3 minutes, until golden brown on one side. Flip and cook the other side for an additional 3 minutes. Transfer the chicken to a plate. Don't worry if the chicken isn't cooked completely through, it will finish cooking in the oven. Add the garlic and shallots to the skillet with the chicken juices and cook for one minute, stirring frequently. Add the bacon and cook until slightly crispy. 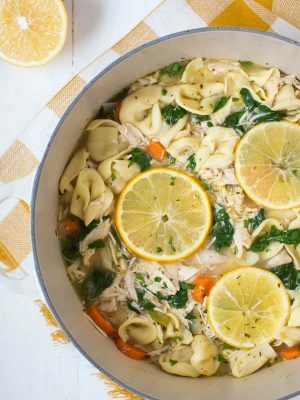 Pour in the cream, chicken broth and Parmesan. Stir to combine and simmer until slightly thickened, about 2 to 3 minutes. Add the spinach and red peppers and cook until spinach is melted. Add the chicken back into the pan and drizzle the sauce over the chicken. Allow to simmer for an additional 2 minutes. 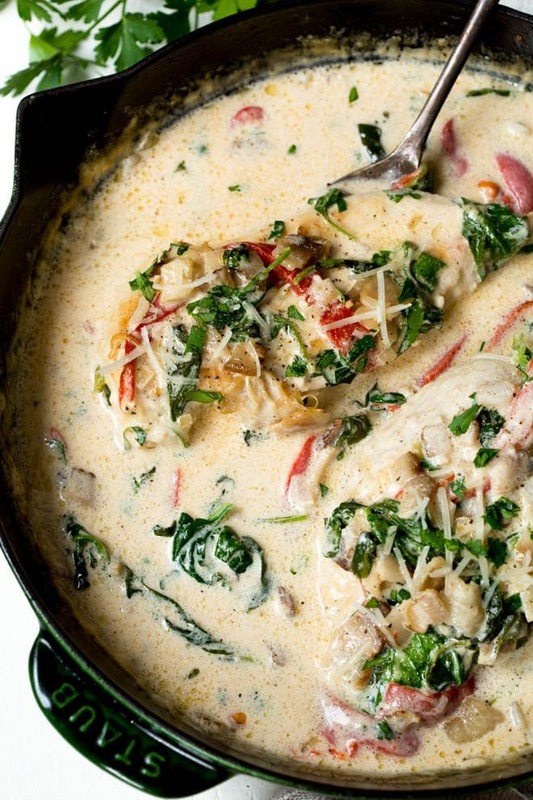 Place the skillet in the oven for 5 to 8 minutes, or until the chicken is completely cooked through. Garnish with fresh parsley and shaved Parmesan, if desired. 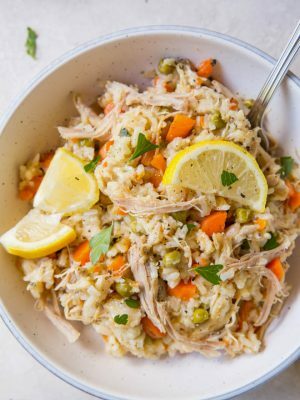 Serve over rice, pasta or with steamed vegetables. 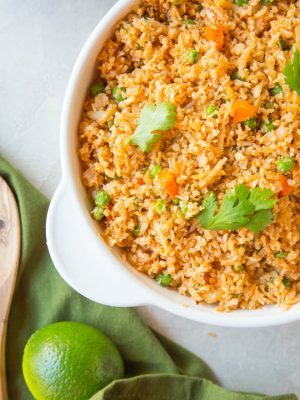 Serve this recipe with rice, quinoa or steamed vegetables. This dish looks sooooo delicious! I can hear my tummy growl. Lol!